British Ambassador to the State of Qatar, HE Mr Ajay Sharma welcomed around 800 guests to mark the 93rd birthday of Her Majesty Queen Elizabeth II. The guests of honour in attendance were HE Minister of Commerce and Industry, Mr Ali bin Ahmed Al-Kuwari; HE Minister of Administrative Development, Labour and Social Affairs, Mr Yusuf bin Mohamed Al-Othman Fakhroo; HE Minister of State, Dr Hamad bin Abdulaziz Al-Kuwari; and HE CEO of Qatar Airways/Secretary General of Qatar National Tourism Council, Mr Akbar Al Baker. And from the UK, the Lord Mayor of the City of London, the Rt Hon Peter Estlin; three members of the House of Lords; and the football legend, Sir Geoff Hurst, the only man to score a hat-trick in a World Cup final. 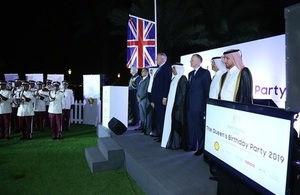 The British Ambassador also hosted senior Qatari figures from business, government and sport, the Diplomatic Corps and other key members of the local community. They were entertained by the Qatar Armed Forces band and Doha Jazz. It is a great pleasure and honour for me to welcome you all to this year’s Queen’s Birthday celebration, to mark the 93rd Birthday of Her Majesty the Queen. As every year, we have a theme for the Queen’s Birthday celebration, and this year it is sport. Sport is a very appropriate theme for Qatar given its amazing sporting facilities (Aspetar, Aspire, the new stadia); and its role in hosting an amazing range of world-class sporting events. But, of course, when we think of sport, we think of the World Cup which Qatar will host in 2022. And as my Prime Minister has made clear, the UK is committed to working with Qatar to ensure that the World Cup is a success. This is a priority for the UK-Qatar relationship; a key area for our co-operation together, from our police forces to our companies, from security to design. And I have no doubt that the World Cup in Qatar will be an amazing success. But the reason why sport is such an appropriate theme is because of what sport is about and the values of sport. Sport is about bringing people together and sharing an experience, creating a sense of community; and it provides a platform to show the best that we can be. I can’t think of anything better than that. It is about excitement and passion, it’s about hard-work and creativity, it’s about determination and resilience; it’s about individuality and teamwork. The kind of things, the kind of qualities, that you need outside of the sporting arena if you are to succeed. And underpinning any sport is a set of rules, the rules of the game – and a positive spirit in the way that you respect them, what we call in a very British expression that I am sure is familiar to all of you, a ‘sense of fair play’. And just like the qualities of a successful sportsmen and sportswomen are so important outside the sporting arena, so are the values of respect for the rules and implementing them fairly. Without respect and compliance with international law and norms, everything will ultimately fall into chaos and disarray. This is why the UK government is so committed to defending the rules-based order, to making sure international institutions work effectively and can take action when needed. And I know that our Qatari friends are on exactly the same page as us. And there is, a lot more, of course that I could talk about where we are on the same page with Qatar, where we are working closely from the 2030 National Vision to defence, from trade and investment to healthcare and education. The British Embassy would like to thank the following companies: Shell – our platinum sponsor – and our Gold sponsors – Standard Chartered, BAE Systems, Gleeds, and Clyde and Co. who in their sectors - oil and gas, banking, defence, construction consultancy legal services represent the best of what the UK can offer. We would like also to thank the Edge Production company, Harrods and 51 East.